Today's Word of the Day is: Hanami (花見）, which is the term used for flower viewing here in Japan, specifically in relation to Sakura, aka Cherry Blossoms. Because Cherry Blossoms only last a few weeks before the blossoms fall and fade away, they hold a special place in the hearts of the Japanese people, and thus, whenever they are in bloom, everyone stops what they're doing to go out and admire them. Along with the Weather forecast on the nightly news, there is certain to be a report on where the Sakura are blooming and when they will fade. 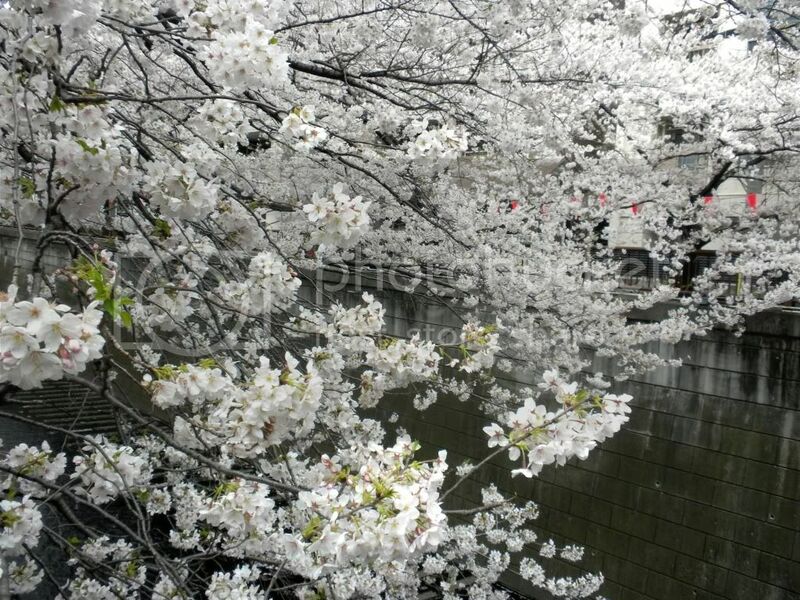 Typically they bloom from the West of Japan, moving to the East, and here in Tokyo, they are finally in full swing. Hanami is such a big thing here in Japan that even entire companies take hour off to go collectively and sit on blankets under the trees (which lowly minions have been staking out since the wee hours), eating BBQ, bentoes (lunch boxes), basking in the Sakura's beauty and drinking late into the night, when all the lanterns that have been strung up special for this time, come on and prolong the loveliness and viewing. It just so happens that I live about two blocks away from one of the most famous spots in Tokyo for seeing Cherry Blossoms, a river called Megurokawa, which is lined the entire length by them. Traffic around the river is a big dodgy for drivers who are having to stop and avoid hundreds of dazed pedestrians, but the sight is quite gorgeous. And it also just so happens that the man who's company built this apartment complex (termed 'Mansion' over here), lives here and his company, as many do, was having a special outing/party for the occasion, and my family was invited. So just around noon today, my host mother and I, my host father tagging along somewhere behind, walked the two blocks to the river and then followed it aways, stopping to take pictures and admire the beauty, before happening upon the little gathering that was being held in an open garage of sorts. We signed in, were shown to our seats by handsomely sophisticated looking young men in black suits and ties, obviously the underlings in the company, and our order for drinks (alcoholic or otherwise) were taken. Not long after that, a very fance bento made up to look like a ornamental box, and a cup of soup was placed before us, and various uppety-ups came over to talk and schmooze. The man who had invited us, I had met once before, at my host father's ritzy Lion's Christmas party, and I found him to be a very agreeable sort of man. My host mother later told me he was in his early sixties (though he looked like early forties), with a 30-something year old wife. But he was affable and pleasant and spent most of his time talking with us, even after my host father slurped up his lunch and took early leave. We also talked to a man I'm assuming is the head of the company, and he was rather pleasant as well, as were they all really. There was talk of various things, happiness in marriage, vacations to the sea, the beauty of the cherry blossom trees, etc., and then my host mother reminded us that we still had tea lessons and had to get going. Thus we took a commemorative photo and then left, her showing me another way back I've never been to, though it couldn't be but a few streets over, and it was an interesting sort of street with all manner of shops strung along it. Anyways, so that's the blow-by-blow of my Hanami experience. In other news (which seems to be a phrase I use a lot, but oh well), I also went to The KIDDIE's final concert on their first one-man tour. For the first time since ever, I wasn't one of the last 5 people to get in (despite my ticket being C 249), and was lucky enough to get a spot on the perimeter. Let me tell you something about Jrock concerts, and perhaps Japanese concerts in general. Because you are admitted one by one acording to the number on your ticket, people don't go and stand in line 4 hours early to get a good spot. At first I thought this was nonsense, because if I'm willing to wait in line for 4 hours, I should get a better seat. But after going to enough concerts now, I see the infallible logic of this system. Everyone is equal and there's no rivalry and it works. Also, and this is something I don't understand... first of all, at almost any venue, you have to purchase a mandatory $5 drink ticket, which you can use on whatever they offfer (water, cocktails, soda, etc.). So, when people get admitted, rather than rushing into the venue and getting a place close to the stage, most people just mill about. And once the concert starts, people don't attempt to get any closer than wherever they land, though there is ample room to do so. In Jrock concerts, the very front maybe 30 people (so a few rows equivalent), those spots go fast, and then around the perimeter (that is the walls and anything solid to lean against) go fast. The reason for this is, at these concerts, there is a lot of waving of hands, clapping, what have you, and then, because it is Rock, there is jumping. And most people have at least a purse. Now, there are lockers you can use, if you get there before they're all taken, but you're usually left carrying something into the venue, so if you find a place on the perimeter, you can deposit it there and ensure it won't be crushed. Many times, people will leave there stuff there and then go off into the crowd, coming back for it at the end (as there's hardly ever crime in this country, there's no concern over theft). So, back to what I was saying, I got a spot on the perimeter, which I love since my back is screwed up, and after waiting an hour in line, then an hour for the show to start, then however long it takes for them to actually start (they never start on time), my back was hurting, but I had a rail to lean against, so it was all good. Oh, and another interesting, 'first time' at this concert was, there were special people being admitted with VIP passes while I was standing in line. 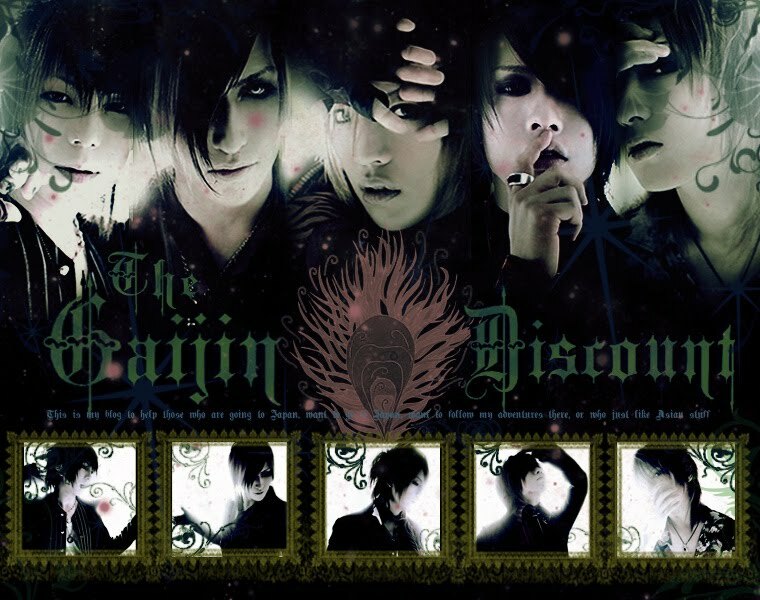 Some, you could tell, were big wigs from other companies, who just had that air of 'coolness,' and then in the back, in a cordoned off area where there were seats and small tables, were guys that were quite obviously other Visual Kei bands. I didn't recognize any of them, but that is undoubtedly what they were. So anywho, the live (concert) was great, lots of fun as always, and at the end, they announced that they had finally got signed with a major label (King Records, I think), which I was quite happy to hear since I've been pulling for this particular band for a while. They have, I think, a lot more talent than most of the bands out there, and appeal and seem like nice guys, so I was glad to hear the news. Of course, this being the finale of their very first independent tour, they were all quite emotional and spent a long time saying things to everyone, saying how they've had the strength to stick with it because of the smiles of the audience, and their warmth has washed away all the fears. And then they revealed these five banners that the fans at all the concerts on this tour had made. It was rather cute. And then they finished with my very favorite song, Noah, which I will post below. The words to this song in particular, more so than probably any other Japanese song (at least that I can think of now), are rather beautiful to me. The beat is nice to, but I love the words. So anyways, good luck to The KIDDIE. Unfortunately, I think this was the last time I'll ever get to see them, as their next concerts are in Sept., and I will already be back in the old US of A. So anyways, that's my 25 cents for now. School kicks back up on Monday (sort of, I think). And we'll see how that goes. I've also continued by KimuTaku fest, but this is a long blog entry already, so I'll blurb about that some other time. Ciao! PS: This translation might be a little hard to understand, but it's the only one I could find on Youtube. Maybe I'll translate it someday ; ) And what ho! Sakura make an appearance in the lyrics/video!